Recognized by G.I. 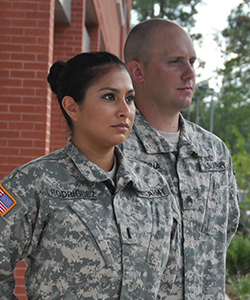 Jobs as a 2013 Military Friendly School, SHSU has the programs and people in place to help you pursue your goals. The Veterans Resource Center is dedicated to assisting veterans and dependents of veterans with the transition into university life. Additionally, veteran students receive unprecedented support from VetSuccess on Campus, a collaboration between SHSU, the VA, and Vet Center personnel in order to better serve the men and women who have honorably served our country. The same application is used for admission to a bachelor’s degree program or master’s degree program with on-campus or online classes. Complete an online application through ApplyTexas.org [what's this?] and pay the $45 non-refundable application fee at ApplyTexas. Alternatively, you may pay the application fee directly to SHSU after completing your application through ApplyTexas.org. SHSU will receive your application within 24 hours of submission and after that period of time, you may mail a check to the Undergraduate Admissions Office or pay the application fee to SHSU with a credit or debit card. Qualifying students may submit an application fee waiver request (PDF) to SHSU Office of Undergraduate Admissions. Send applicable transcripts (college/university transcripts and military transcripts). Learn more about obtaining military transcripts. Note: Depending on which Internet browser you are using, you may need to add a "Security Exception" when prompted to view the above site(s). Or send electronic official college transcripts to Sam Houston State University (code: 003606). Please note that the Undergraduate Admissions Office does not accept fax or emailed college transcripts. Visit GIBill.va.gov to learn which benefit you are eligible to receive and to complete the Veterans Online Application (VONAPP) for GI Bill benefits. If the VA finds you eligible, they will mail you a “Certificate of Eligibility” or an “Award Letter” with information about your benefit. Please submit a copy of your Certificate of Eligibility to the Veterans Resource Center immediately upon receipt (via email, fax or drop off in person). Learn more about the policies and procedures for requesting and processing your GI Bill benefit and/or Hazlewood Exemption. See other chapter benefits at VRC Financial Aid. Learn more about Tuition Assistance programs. It's important for students using military/veteran education benefits to discuss course plans with a Veteran Liaison/Advisor prior to enrolling. The advisors will assist you with your degree plan and ensure your classes are eligible for benefits. Submit a “Request for Certification” form for the appropriate semester(s). Please do not wait to receive your “Certificate of Eligibility/ Award Letter” before your complete this form. You must do this every semester and complete a separate request for summer, if applicable. If you meet the requirements please email admissions@shsu.edu for more information. Open Monday through Friday, 8:00am to 5:00pm, with the exception of University holidays. If you have questions please contact one of our Admissions Counselors or staff members at the Undergraduate Admissions Office. Prospective graduate students with questions may contact Graduate Admissions.